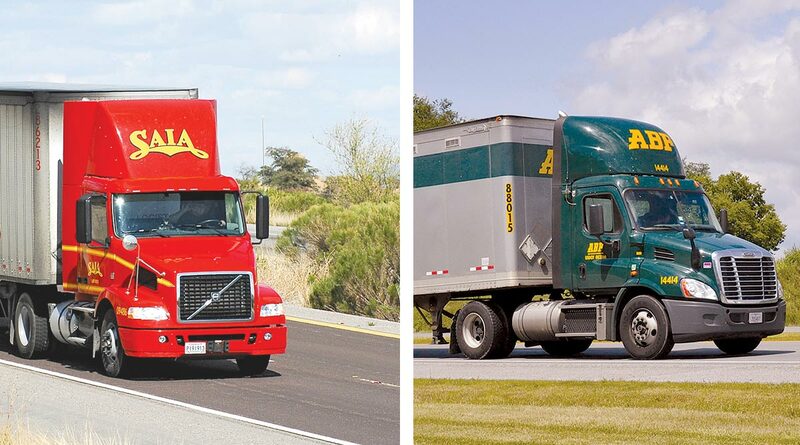 One day after Old Dominion Freight Line Inc. impressed industry analysts with a robust second quarter, two other less-than-truckload carriers — ArcBest Corp. and Saia Inc. — followed with stronger-than-anticipated financial results. ArcBest’s profits surged 54% to $15.8 million or 60 cents per share, and Saia’s jumped 33% to $17.6 million or 68 cents. ArcBest beat the Bloomberg News consensus analyst forecast by 9 cents, and Saia was a nickel higher. ArcBest’s revenue grew 6.5% to $720.4 million, firmly putting its $7.4 million net loss in the first quarter to rest. The company’s asset-based revenue, mostly less-than-truckload, was $514.5 million in the second quarter, 6.7% higher than the same period in 2016. Tonnage per day eked out a 0.1% gain to 13,233, shipments per day increased 4.4% to 21,583 and revenue per 100 pounds of freight rose 6.1% to $30.84. After deducting expenses, operating income rose to $22.2 million compared with $17.4 million in the same three-month period in 2016. The third-party logistics division saw revenue climb to $212.4 million from $196.1 million year-over-year. After deducting expenses, operating income more than doubled to $6.5 million from $2.8 million in the second quarter of 2016. Expedited revenue per shipment rose 14%, and shipments per day improved 4%. Truckload shipments went up 6.8%, and shipments per day jumped 18%, although the company didn’t disclose precise figures in either category. Through the first half of 2017, revenue has risen 5.7% to $1.37 billion. Profits have doubled from last year to $8.37 million. Meanwhile, Saia generated positive revenue growth, up 15% in the second quarter to $358.2 million. Less-than-truckload tonnage rose 7.1% to 984,000, shipments were 7.4% higher to 1.76 million and revenue per 100 pounds of freight improved 7.3% to $16.89. In the smaller truckload unit, tonnage grew 11% to 203,000 on a 10% increase in shipments to 28,000 and a 6% rise in revenue per 100 pounds of freight to $5.83. The average length of haul combined in both divisions increased 20 miles to 806 per shipment. “For the balance of the year, our focus will be on our Northeastern expansion, cost control and mix management. Given growing volumes, it is particularly important that all freight meet increasing profitability criteria,” O’Dell said. In the first half of 2017, revenue increased 12% to $675.2 million and profits jumped 22% to $29 million. ArcBest and Saia rank Nos. 12 and 28, respectively, on the Transport Topics Top 100 list of the largest North American for-hire carriers.